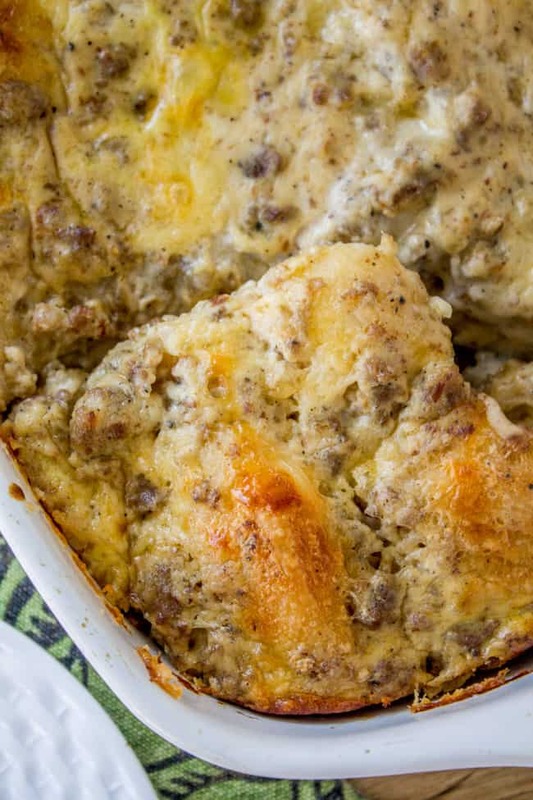 Biscuits and gravy casserole that you can make the night before! Just throw it in the oven in the morning. Use canned biscuits but homemade gravy. It is perfect for Christmas breakfast! For some reason Eric and the kids and I were talking about wishes the other day, and I asked Eric what his 3 wishes would be RIGHT NOW, 10…9…8…7…6…5…4…3…2…1. What would you wish for? You only have 10 seconds to decide! GO!! WELL PLAYED, FOUR YEAR OLD. You win. Well since we can’t munch on our chocolate pencils or snack on our cheese-flavored iPhones, I guess we’ll have to make real food. 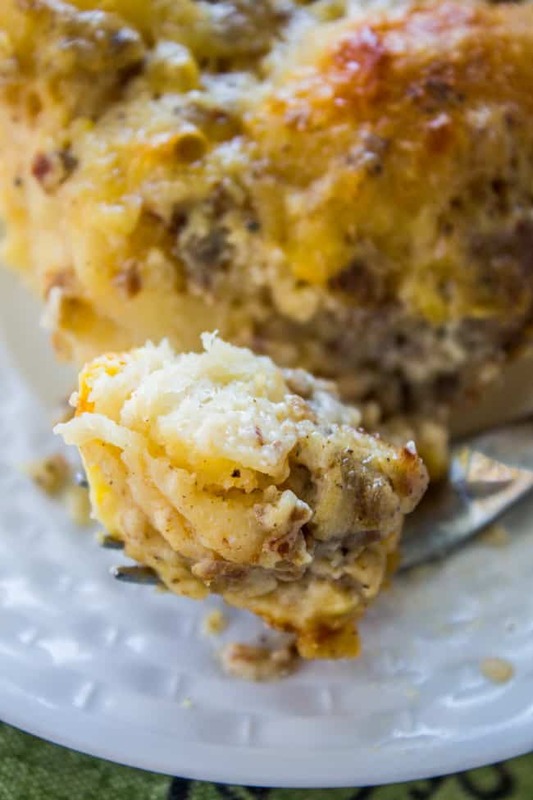 You will not BELIEVE how good this overnight casserole is guys. My mom didn’t serve biscuits and gravy growing up, but I fell in love with the ones they served in my freshman college cafeteria. My brother Nate went to BYU with me, (Cannon Center, fellow alumni? :) and he and his roommates would go back every semester after finals and pay their 7 bucks or whatever it was just to treat themselves to biscuits and gravy. I’m jealous I never thought to do it. I got the recipe from Miss Information (who has such a cute blog, check it out!) Her recipe calls for a gravy mix, but I wanted to do a homemade version because I like the flavor and it’s not hard. So I nabbed The Pioneer Woman’s sausage gravy recipe and OH MY GOODNESS. 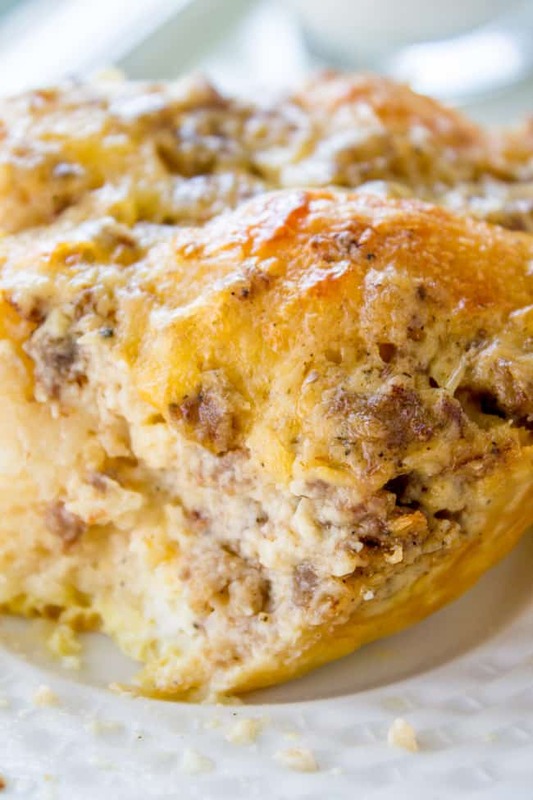 Best biscuits and gravy casserole EVER. If you make this for Christmas, everyone will LOVE you. If you make this, snap a photo and share on social using the hashtag #thefoodcharlatan. I’d love to see it!! In a large skillet, brown the sausage over medium-high heat, breaking it up into small pieces with a wooden spoon. Reduce the heat to medium-low. When the sausage is cooked and no longer pink, sprinkle half of the 1/3 cup flour on the sausage and stir until it is absorbed. Add the rest a little at a time, and stir until all the flour is soaked up. Stir for 1 more minute to get the flour taste out. Turn the heat to medium. Pour in the milk, 1 cup at a time, stirring to thicken it up each time. Once you have added all the milk, continue stirring for another 10-12 minutes until the gravy has thickened up some. 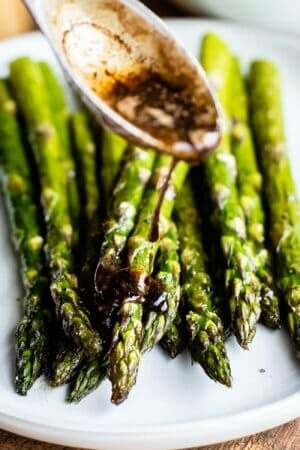 Add 1/2 teaspoon seasoning salt and 1 and 1/2 to 2 teaspoons pepper. Grease a 9x13 inch casserole dish. Open the can of biscuits and separate all the biscuits. Use scissors to cut each biscuit into 4 pieces. Drop the quartered biscuits onto the prepared pan and spread them out evenly. Pour the egg mixture over the biscuits. Sprinkle with 1 cup cheese. Pour the gravy over the cheese and spread it out. (At this point you can cover tightly and refrigerate overnight). Bake in a preheated 350 degrees F oven for about 38-45 minutes if you are making is right away. If you have just taken it out of the fridge, cover with aluminum foil. There is no need to preheat the oven first. Just put it in the oven and turn it on to 350 degrees. Bake for about 30 minutes, then remove the foil. Continue baking for another 15-30 minutes, or until the biscuits have browned and the sauce is bubbly. (45-60 minutes total if it's been in the fridge overnight). *All of the spices I put in the eggs are totally optional. 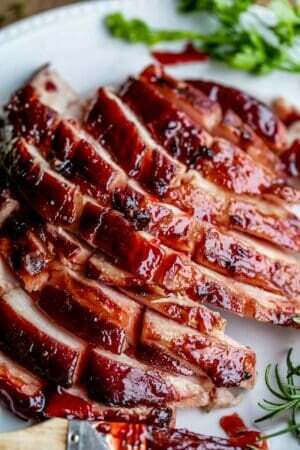 That's the way I like it, but you can add just salt and pepper if you want to keep it simple. Source: recipe changed a bit from Miss Information; gravy recipe from The Pioneer Woman. 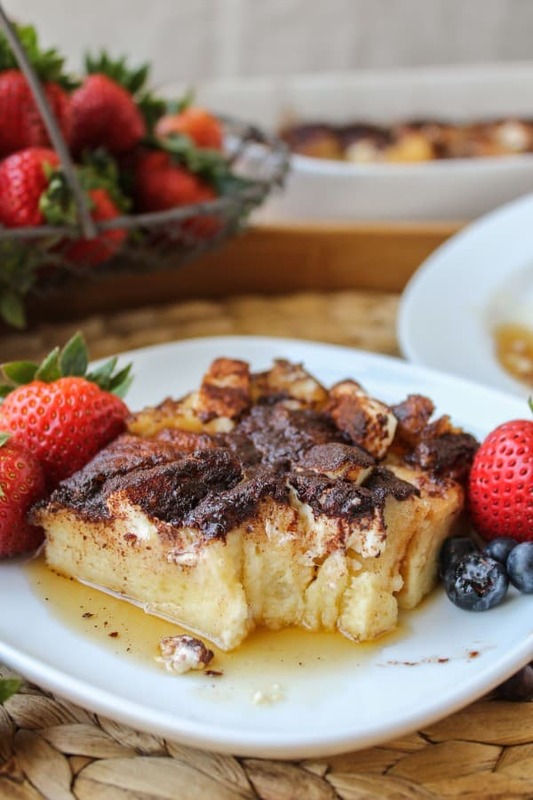 More breakfast ideas for Christmas! 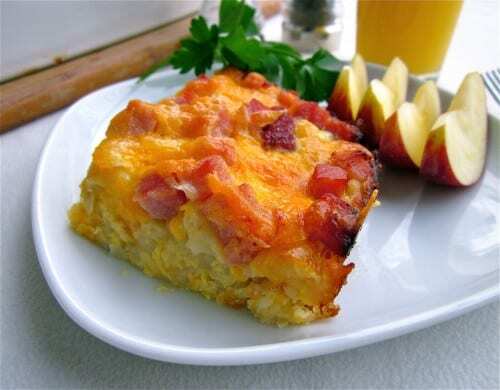 Breakfast Casserole with Potatoes and Ham << This is one of my absolute FAVORITES! We make it every year at Christmas. 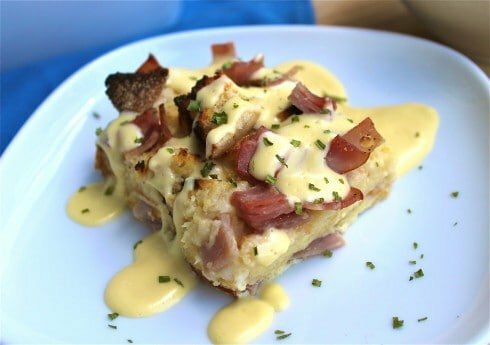 Eggs Benedict Casserole <<this is a reader favorite! Or how about something sweet? 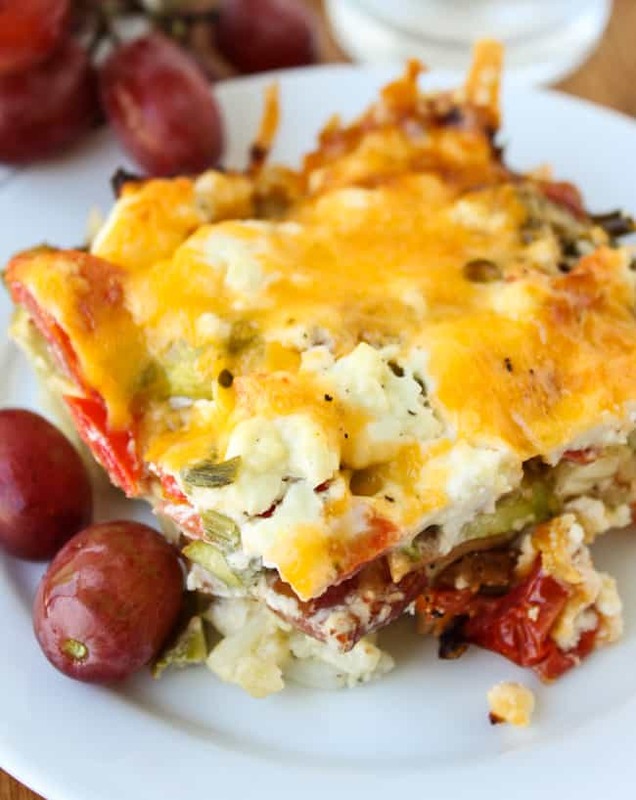 Green Chili and Cheese Egg Bake from Recipe Girl. 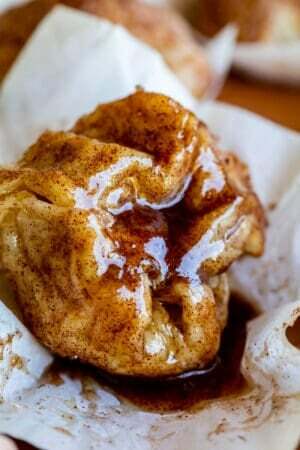 << I love this recipe and have made it at least 4 times. Well, this looks FABulous! Will it work to make a 1/2 recipe? I know my husband and I would eat it all and that is probably not a good idea (well, it’s a GREAT idea, but…) Forgive me if you have already answered this. Do you think I could freeze this??? at what point would i put it in the freezer? Many thanks!! i’m traveling a far distance and was thinking it would be best to freeze it. Thanks in advance!! Absolutely Molly! Here’s what I would do. Make 1 and 1/2 times the sausage gravy. take out some of the gravy and set it aside, then bake the casserole as written. Bake completely, freeze completely. Freeze extra gravy separate. Then thaw completely and bake again until hot, then serve with hot extra gravy. Does that make sense? I just feel like freezing might make it a bit dry. Just had this for dinner with my Grandma and it was soooo yummy!!! This had all the flavors of a strata that my Grandma made every Christmas morning my entire life. She loved it. Her’s is made with bread not biscuits, so the eggs soak into the bread. I was so excited when the eggs sunk to the bottom instead of soaking into the biscuits and created an egg layer. I think next time I’m going to sauté mushrooms, peppers, and onions and put them in a layer on the bottom so it’s like an omelette layer. Have you ever made this with homemade biscuits? I want to try, but I’m concerned my biscuits will rise too much and create an overgrown disaster monster in my oven. Hey Shelley! So happy to hear the recipe was a hit! 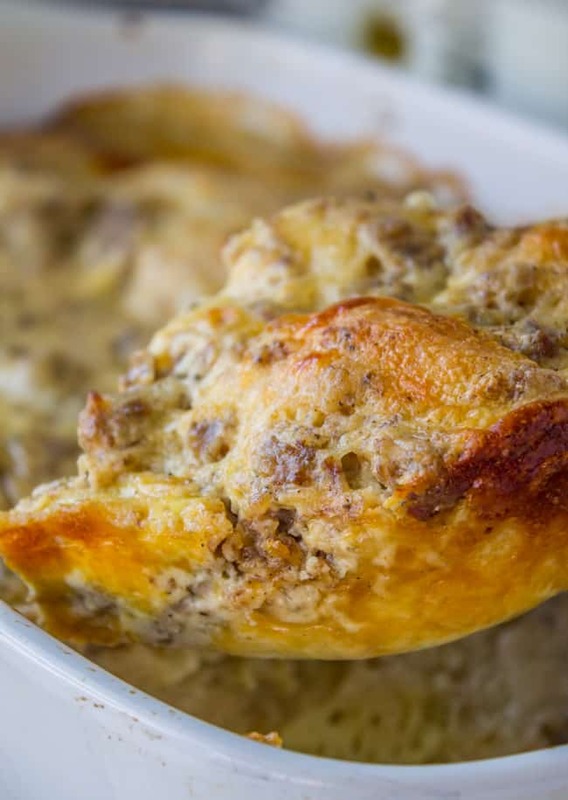 Your grandma’s strata sounds wonderful, let me know if you can find the recipe :) I haven’t tried this with homemade biscuits but I think it would work great! I’m wanting to make this to take camping this week for the 4th of July. My plan was to make it and another of your breakfast casseroles tomorrow and then refrigerate (cooked) and reheat on the day we need it (Weds, Thurs, or Fri). Have you done this before? Do you think it’ll reheat well after sitting in the fridge a few days? Hey Ashley! Yes I think that’s a great option for camping. How are you planning to reheat it? I went camping a few months ago and baked an egg casserole before we left. On the day we wanted to eat it I used coals to heat it up, just like Dutch oven cooking. I had baked it in a disposable aluminum pan and then wrapped it several times in heavy duty foil. (Because we put coals on the bottom and on the top.) Let me know how it goes! Happy fourth! Can you substitute almond milk for the whole milk? Hey Ashley! I haven’t tried that. I THINK it would work. Do not leave out the flour obviously. It will be a lot less rich. I can’t guarantee it will work because I haven’t tried it. Let me know how it goes! This was great! I made it for a brunch for five of us, and we almost finished it off. And this is in NYC, where people are not exactly used to sausage gravy! Served with a fruit salad and mimosas, and mini-tarts for a completely unnecessary dessert. I baked it in a deep oval dish that I recently inherited, which worked fine but definitely bumped up the cooking time. You had to dig a little to get at the biscuits, but it was worth it. There’s always room for dessert I say :) I’m so glad the recipe was a hit! Thanks for coming back to comment, it means so much to me! Happy New Year! I made this the night before Christmas and then baked it Xmas morning— the house smelled sooooooo amazing and all our family (there was 11 of us) LOVED this casserole. It was fantastic! There were zero leftovers which means I’ll just have to make another one because I’m a huge biscuits and gravy for breakfast kind of person. THANK YOU! Yummy, that is a GREAT idea!! This is my first time visiting your awesome blog. This sounds like something I definitely want to try though I’m not fond of canned biscuits. They taste … canned. Bisquick biscuits are a snap; have you tried the recipe using a fresh batch? Any reason they wouldn’t work? Thank you for the compliment Rich! That is such a good idea with the Bisquick. I generally am not overly fond of pre-packaged food like biscuits, but I also know that I would rarely make this if I had to make the gravy AND the biscuits from scratch. So I picked one (gravy) and went with it. But I really like the idea of doing bisquick. I think it would work great. I would pat out the dough and not even bother cutting it into rounds; just use a pizza cutter to cut the dough into 1 and 1/2 or 2 inch pieces (roughly the size of a biscuit quartered) and throw them in the pan. Let me know how it goes Rich! Great idea! Looking over the spices, I have a quick question, by mustard, do you mean dry mustard? I’m assuming but wanted to double check. I making this for the ward christmas party tomorrow. What better way to try a new recipe? It was delicious! I need that gravy in my life on a regular basis. Right Nancy? It’s so good! Thanks for the review! Now I’m dreaming of an edible world. I’ll start with this dreamy, creamy casserole. Because, gravy and carbs. Wouldn’t that be awesome though?? No more hunger. Although the obesity rate would skyrocket, haha. Thanks Jennie! hahaha Charlotte’s answer!!! She definitely wins!! PS this casserole looks so so good. Oh my! My parents are coming to visit over Christmas and I will have to make this for them. It looks so homey and comforting. This is kind of amazing!!! Did Charlotte really say “edible”? She’s 4 for goodness sake. What are you guys reading to her? The dictionary? Ok now we have to make this too when you guys are here! We will need to have about 6 meals a day (breakfast, second breakfast, elevensies anyone?😉) in order to make and eat all the food we want! I love biscuits and gray, and this is such a great idea. I really like the idea of having this on Christmas morning. And that gravy sounds crazy good! Every year I try to come up with a new overnight casserole for Christmas morning. I have found it for 2015! Thanks so much for posting this. Awesome Susan! That is such a good idea to do a new casserole every year! We have a tradition on Christmas Eve where we do a different ethnic food every year (Italian, Filipino, German, etc.) Sometimes the tradition is trying something new :) I hope you guys love it! 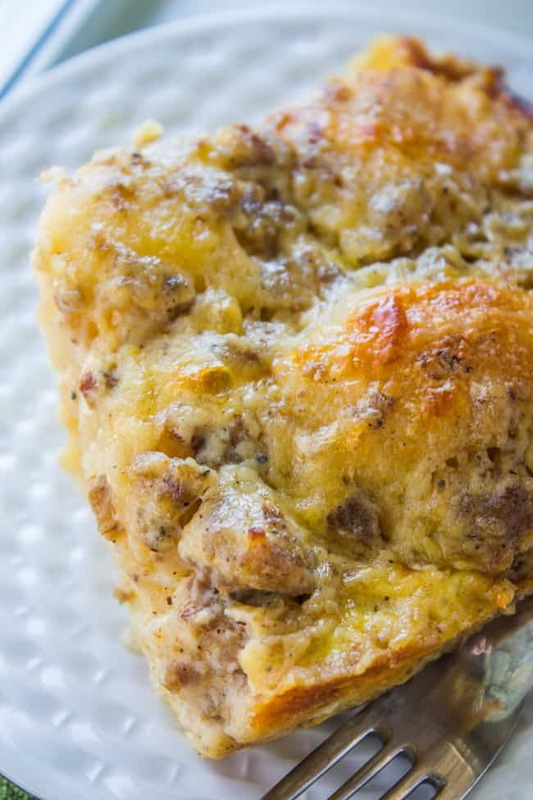 I am not a biscuit and gravy person, but my husband and my dad LOVE them and request them every Christmas–I will have to make this for them to make Christmas morning easier!